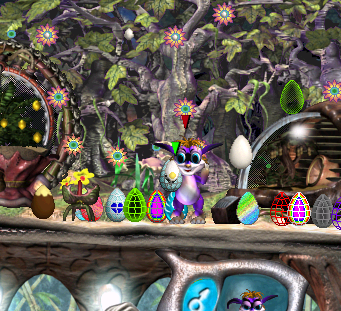 The Eggstravaganza is a Garden Box patch plant, created by Laura, Mea and Ghosthande, with sprites by many members of the Creatures Community. It can be downloaded from Garden Box Central. It was created during the Creatures Caves Eggstravaganza event, and contains 560 unique egg sprites. All contributors are named in the accompanying readme file. The eggs also come in three flavours to tempt a creature's sweet tooth: Chocolate, caramel and hard-boiled. This page was last modified on 13 September 2014, at 21:27.